* I tried LaserWeb but gcode is G1 X0.0 Y68.5 S41 which does not turn on the laser in marlin, i had updated machine definition with M106 but i still get this code format. Edited 1 time(s). Last edit at 04/05/2016 10:34PM by luismanson. I run the Turnkey Tyranny firmware (Marlin based) on my laser cutter. With some mods it is no problem to do 8bit engravings at quite high speeds (in my case 6000mm/min). But I thought most people GRBL on their diode laser machines? You should check if your laser driver supports the "on-off" method for the PWM signal - it can't be too good for the electronics. The TTL input does exactly the same, it turns on if there is a signal and off if there is none - big difference is that the electroncs stay powered and won't get the shock from switching on. Question is if the TTL input is fast enough but it should. Give Image2Gcode a chance, it should do what you want. Otherwise you can still modify the firmware to accept the commands you need or use Notepad++ to replace the "Sxxx" with "\r\nM106 Sxxx\r\r"
Edited 1 time(s). Last edit at 04/06/2016 06:24PM by luismanson. The firmware can be used for single and daul pin firing. just one pin and just the PWM signal. The TTL logic is slightly different from a real PWM control, it needs some time for the signal to rise and fall. Around 5ns for this is a normal value. Try the "FADE" example and instead of a LED you add the TTL input. To be on the safe side with the unknown module put a 1k resistor is series with the TTL input. Now when you upload the sketch your laser should change intensity from off to full and back just like the LED. If that works than it should work in a similar way through the Marlin Firmware, if not you can still try to set the PWM frequency from the standard 8kHz down to 5kHz. It would be nice to know what controller you have? there should be a trigger pin to start and stop diode laser. What is your intended use? Engraving, cutting or just fring your eyes? will show how a real USA unit is set up. Im using RAMPs with Marlin. When you only have a TTL input on the diode driver you can use for example one of the servo pins, which you dont use anyway. Either reconfigure your firmware to use the servo pin, typically pin numbers in the range 4-7, as the fan pin and then use M106/107. because someone thought it was a good idea that M42 is performed asymchronpusly. M400 makes sure it happens at the expected time. Thanks falwty99, thats the info i needed. ... I'm using Pronterface and Marlin4Due for developing a paste-dispensing application, but it's the same for laser-engraving too. The main change in Marlin4Due was to set the "smallest E-step range" to 0 ... it was set to 5, so when starting a line or single pulses, only every 5th E-step produced a pulse. ... while "G0 X11.1 Y22.2 F6000" and "G1 E15 F1000" will create a 'blob' with 15 droplets on the same position. well...to be honest. i dont get it. I guess the electronics of this laser works diferently. Now...D42 works, on/off control. but it ignores D9 power level...I guess its taking 12v directly and D9 mosfet works on ground?? Edited 2 time(s). Last edit at 04/10/2016 07:10PM by luismanson. What Marlin are you using? Standard? Turnkey Tyranny? Something else? The TTL input should work with 5V but not 12V - can be wrong though. If you power the laser it should be off, give 5V on the TTL input and the laser goes on. There might be a jumper for this. Usualy approach would be to power the laser with the machine and to have the laser TTL connected to the PWM output. so one of those pins should be fine. Perhaps best to avoid the servo pins if you use a servo but I am not sure there. 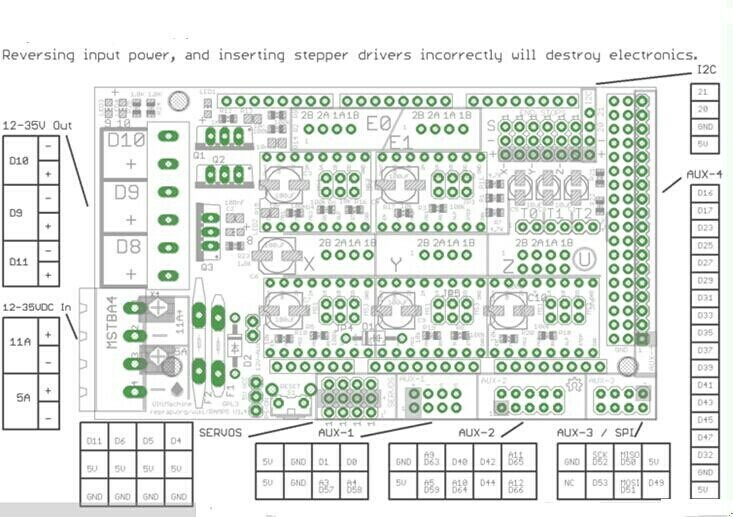 Other pins will just be ON or OFF, so if you used D42 then it should be on or off. D44 is in AUX-2 [www.geeetech.com] , try that. Regarding D5 - you didn't happen to plug it into the +5V? There are three pins +5V, D5 and GND. Edited 2 time(s). Last edit at 04/11/2016 05:30AM by falwty99. well..laser on/off no PWM ¬¬ <=254 off / 255 = on, full power. It will go on during download of new firmware as well. Some let you choose laser control command others are fixed. Some treat laser as just another splndle. I am using Shapeoko 2 driven by GRBL with laser in place of spindle. controlled by timer 5. So pins 44-46 can not be used for PWM when also using servo. Without servos is should be fine with pin 44-46.
thus a floating voltage can be seen from the pin. Obviously interpreted as "high" by the laser driver. Easiest solution is to connect a small pull-down resistor to the TTL positive pin. I will do that myself, good that this question came up. Edited 1 time(s). Last edit at 04/13/2016 03:19AM by falwty99. falwty99, thanks for the explanation, case closed on that one, I did a test about the seccond issie, my solution was to also define that pin as a servo, laser is OFF at startup. Since i still have ground via D9, i do not know, if there is a small pulse on arduino startup, I'll conect 12v directly to be sure and in any case go with your solution resistor between signal and ground. should it be 1 or 10K? Edited 1 time(s). Last edit at 04/13/2016 05:41PM by falwty99. May I know how is the wiring done for this 2 pins between RAMPS and the Laser TTL board? Is there any wiring diagram? Thanks a lot.